culture – Page 14 – absolutely intercultural! 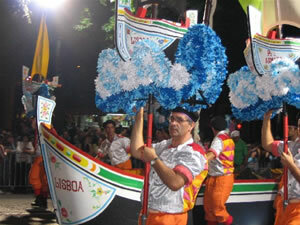 This episode comes from Portugal where we begin with a colourful street parade which includes a mass wedding. We visit ELO SOCIAL, a place where disabled adults can work, rest and play and talk to Luisa, one of the staff.. The German station has noticed the many German flags flying on the occasion of the World Cup and ask themselves about the significance of national flags in different cultures. Flags were also prominent in Portugal and we hear from Cristina Costa, a teacher of English at the Naval Academy of Lisbon about how she feels seeing all these flags. My visit to Portugal was to work on the idea of how mentoring could help disabled people into the workplace. I talked to Nikolaos Floratos about the attitude of Greek employers to this idea as we walked around the palace at Sintra. Next I talked to Vladimir Plesnik of Reintegra in the Czech Republic who had a good reason to welcome the idea of mentoring in his country. The music was provided by Panteras Negras, the ELO SOCIAL rock band. Welcome to the 7th episode of ‘absolutely intercultural!’. After a round of feedback we continue our discussoin about “Culture as the software of the mind” in our column ‘absolutely theoretical!’. We talk about how we integrate updates into our daily lifes and will continue the next time with another aspect. OK, and we couldn’t help noticing that there is something going on in Germany right now – The FIFA World Cup 2006, so the rest of this show is devoted to the game of all games! For our column ‘absolutely personal!’ Anne interviewed John Brodie, a member of the tartan army, about a trip to Belarus he made last year and why he is cheering for the Togolese team right now in Germany. Right after that we have a report of an eyewitness of the match Sweden vs. Trinidad & Tobago. 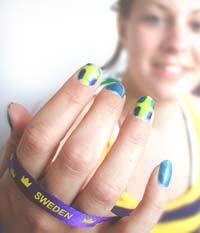 Marie Nilsson from Sweden will let us sneak a peek into the stadium. And for the last part of the show, which we might call ‘absolutely prepared!’, Laurent has interviewed Dr. Beate Blüggel, who works for the “Deutsche Volkshochschulverband” and who has organized the welcoming of millions of fans from all over the world in German trainstations. We hope you enjoy the show. Please let us know what you think about it by leaving a comment here on the blog or by writing us an email. You are of course always welcome to send us an audiocomment and make suggestions on what we should talk about in our shows. The show opens with a song but what is the language? Translating the idea of software of the mind into practice, why not listen to today’s guest talking about the time she lived in a different country and note the tone of her voice when she talks about something which was obviously incompatible with her cultural programming. You may learn more about Icelanders than you do about Scotland which is where Icelander Gunnhildur Oskarsdottir spent three years. After a little round of feedback the German station continues its discussion about the metaphor of culture as the software of the mind, and this time they focus on updates. We finish with the Polar Bear podcast where you will always find out something new about Sweden in every episode. This extract comes from a special joint episode in March where Andy, the Polar Bear podcast host teamed up with Bruce of the Canadian Zedcast podcast and in which they compared notes about misconceptions about their respective countries. In one of our first shows we asked the question: Can culture be taught? And apparently that struck a chord with many of you. We’ve been asked to follow that question up, and that is what we are going to do today. We have two stimulating interviews with Elen Rana and Audrey Fernandez-Diehl, who give courses and seminars in intercultural communication. They will tell us their opinions and share some intercultural activities with us, which can be used to raise cultural awareness. Right after that we talk about Geert Hofstede’s concept “Culture as the software of the mind”. It is amazing how many parallels there are between two seemingly so different things. We’ll have some more insights on that in our next shows, and we invite you to join the discussion by leaving a comment on our blog or sending us an email or an audiocomment. We also have a new jingle, and we’d like to know how you like it. Would you like to hear your voice in it? Well, then please let us know. By the way, this show is with 28 minutes a bit longer then the ones before, but it really is worth taking the time to listen to it. This week the Chinese president travelled West to the United States to meet George Bush. Our virtual journey will take us in the opposite direction. We will take a closer look at one of the most fascinating and diverse but also controversial, countries in the world…China! We have interviewed Professor Stefan Kammhuber, who has both, a scientific interest in the country, but he also fell in love with its people and its beauty. And we’ll hear why Ching, a Chinese girl who studies in Europe, was very impressed by a little Belgian statue. After that we’ll be ‘absolutely indiscrete’ again. This time we talk about the cultural implications of Google’s new Chinese name…and why what was called the “old hound” now likes to be addressed as the “harvest song”. In the end we have a little Chinese lesson for you. Jenny and Ken from the ChinesePod-Podcast talk about politeness in China.